Chicago didn’t play host to this year’s American Dietetic Association (ADA) Food & Nutrition Conference & Expo (FNCE)—Boston had that honor from November 6 to 9—but attendees might have sworn they were in the Windy City when they stepped into the gusts early Monday to catch their shuttle, bound for an educational session or a cruise through the exhibit hall. But Beantown’s blustery, rainy weather outside didn’t put a damper on the activities going on inside the convention center and elsewhere around this historic city. This year’s FNCE was a big to-do, with the ADA reporting an attendance of roughly 11,600—the highest conference attendance in a decade. Navigating the exhibits was a challenge this year, not due to poorly marked aisles but simply because the hall was brimming with attendees standing 10 deep at booths, itching to sample companies’ latest products (such as KIND’s new fruit and nut bar flavors) and learn how their innovative technologies and services (eg, Guiding Stars’ Food Finder tool, a search engine designed to help consumers make more healthful choices in the grocery store) can benefit dietetics practice. On their journey through the hall, attendees stopped by the Today’s Dietitian booth to participate in the magazine’s NuTrivia contest using the game piece provided in their FNCE tote bag. (Of note, this year’s pouch included back straps, an addition for which many attendees’ backs and shoulders were no doubt thankful!) Nutrition professionals gathered at the booth come drawing time on Tuesday, when Today’s Dietitian publisher Mara E. Honicker announced the 2010 NuTrivia grand-prize winner: Ann Pantazis, MS, RD, LDN, CDE, of Northboro, Mass., director of nutrition services at Fallon Clinic. Pantazis emerged from the crowd to claim her certificate for a three-day, two-night Royal Caribbean cruise to the Bahamas. Sandy Wheeler, a retired nutritionist from Springfield, Mo., and Suparb Chiaravanont, MS, RD, CLE, WIC associate director at Watts Healthcare Corporation in Los Angeles, were the game’s second- and third-prize winners, respectively. This year’s conference offered something for every dietitian and other health professional, and the sessions focused on quite a few hot topics in dietetics. Today’s Dietitian contributing editor Sharon Palmer, RD, comments, “For me, there were a few big issues presented at FNCE. ‘The Great Fat Debate’ was spurred by FNCE presenters who took a new look at the research on fat and heart health and suggested that we … stop talking about ‘low fat’ and even consider giving saturated fat a break in our dietary suggestions. This talk spawned a lot of debate among members that still continues today. Additionally, “ADA announced the Kids Eat Right campaign at KidsEatRight.org. This is a national children’s wellness initiative that goes hand in hand with the White House’s child obesity campaign. Every dietitian can get involved by signing up as a campaign volunteer and taking part in even small ways, like posting information on your Facebook page,” Palmer says, wrapping up her educational experience at FNCE. Like past conferences, FNCE’s 2010 sessions offered practice tips and presented new paths of discovery for RDs fresh to the field and even seasoned folks perhaps looking to extend their skills to other areas of the industry. Along this track, longtime Today’s Dietitian writer and editorial advisor Dina Aronson, MS, RD, owner of Welltech Solutions, copresented Monday’s session “Emerging Opportunities for RDs in the Restaurant Industry” with Veronica Alicea, MBA, RD. Aronson led off with some interesting, but perhaps not-so-surprising, statistics considering the prevalence of overweight and obesity in America: U.S. consumers eat about one third of calories outside the home and spend one half of their food dollars in restaurants and otherwise outside the home. On an encouraging note, Aronson cited the National Restaurant Association’s poll result that 56% of people are more likely to visit restaurants that offer organic foods. With home cooking long going the way of the dinosaur, as consumers opt for convenience in the form of fast foods and other restaurant fare, and with Americans showing increasing interest in nutritious and environmentally friendly eating, Aronson explained that dietitians now have huge opportunities to consult for the restaurant industry. They can serve as wonderful resources for restauranteurs, not only providing menu analysis but also helping make their customers’ dining experience both healthful and delicious—not to mention safe for people with food allergies and intolerances. San Diego is the spot for next year’s FNCE (September 24 to 27). The Today’s Dietitian crew hopes to see you there. 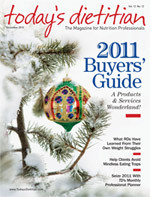 — Heather W. Gurk is editor of Today’s Dietitian.